We hope everyone has a delightful and relaxing Thanksgiving tomorrow, spent with those they love. Until then, never forget and long live #Turkeygate. Click here for a Landmine exclusive podcast with the man behind the camera on that infamous day 10 years ago. While we still have a ways to go (looking at you District 1!) the elections are, for the most part, over. Congratulations to Senator-elect Scott Kawasaki for his win over Senator Pete Kelly. As you may remember, the Landmine team predicted a close race that leaned Kawasaki. Scott, does this mean the Landmine has earned one of those famous Kawasaki annual birthday phone calls? 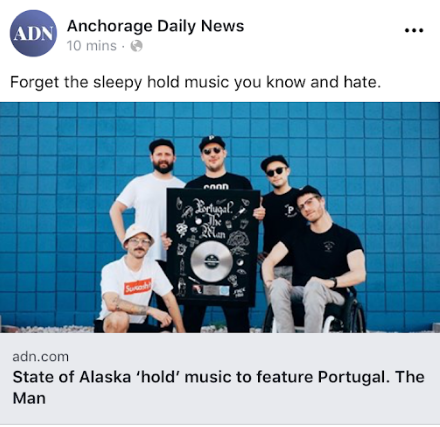 For the record, the Alaska Landmine’s birthday is 10/22/17. You just missed us! 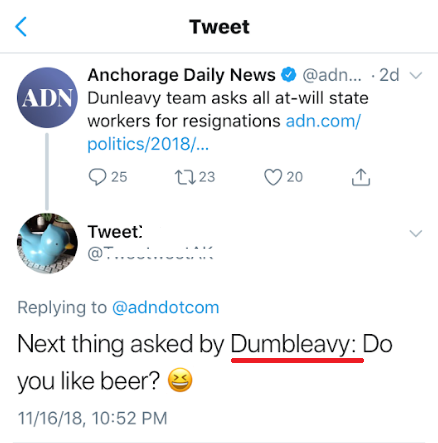 Apparently not everyone got the memo regarding District A. Who’s going to tell him? 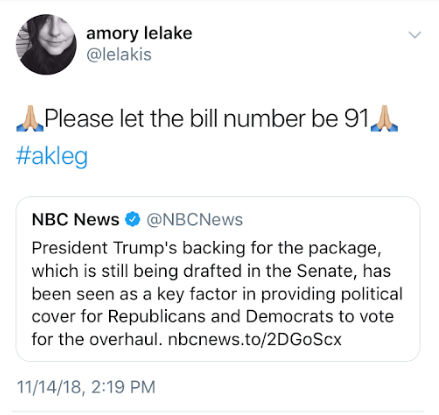 While there were a lot of posts congratulating Representative Kawasaki on his win, this was our favorite. 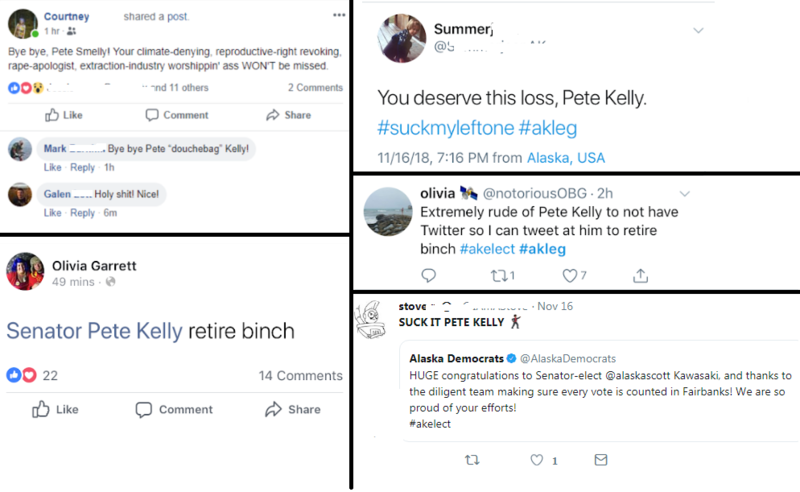 On the losing side of things, people seem to… really hate soon-to-be former Senator Pete Kelly. Because it’s what we do, here’s a compilation. Not their finest moments. Especially those two gems from someone involved in the Kawasaki campaign (and former staffer!). 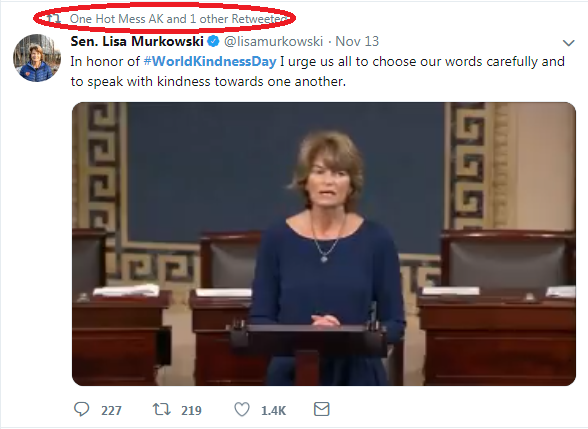 Maybe Senator Lisa Murkowski needs to declare every day World Kindness Day. Oh, look who retweeted it. Now THAT’S ironic. 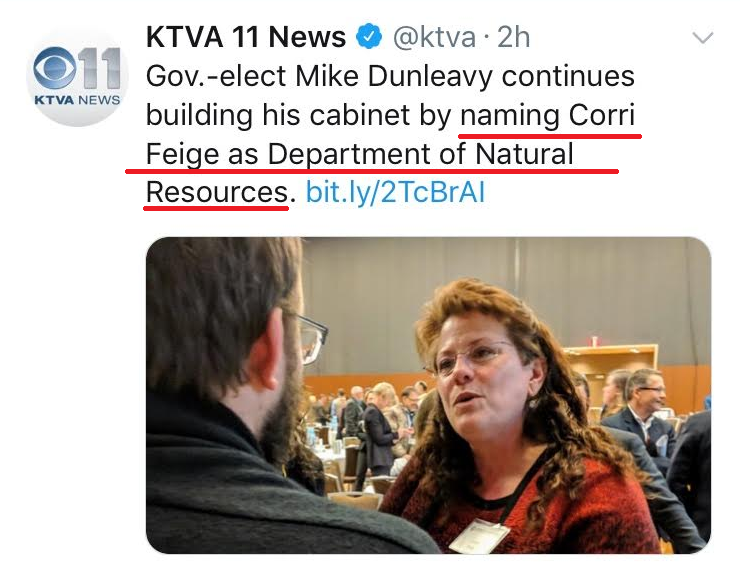 For some reason, the big news this week ended up being all about the Dunleavy team requiring at-will state workers to send in their resignations. Depending on who you ask this is either VERY BAD or VERY GOOD. We slogged through our feed and found some posts on the subject that actually made us laugh. 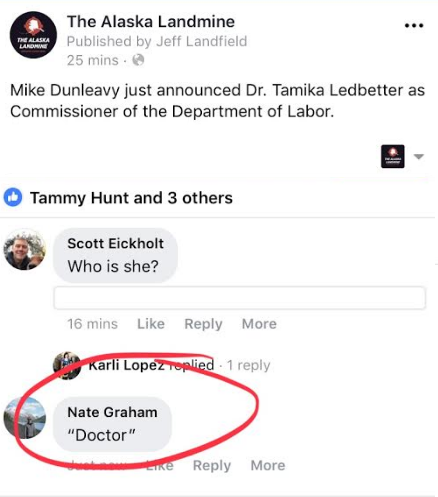 Meanwhile, in this week’s edition of staffers behaving badly… Yikes Nate! We’re glad you deleted this one. 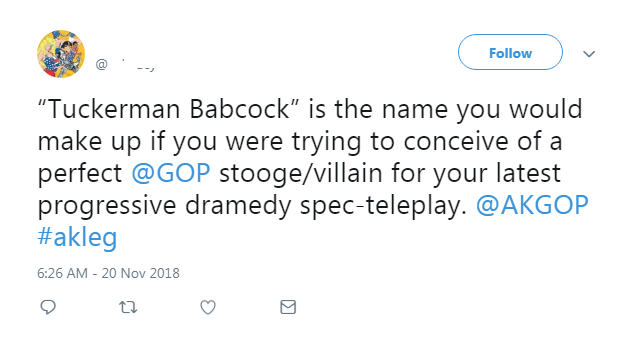 And, in case Tuckerman Babcock-Bannon was feeling left out, don’t worry. The kind folks on Twitter still hate you. At least this observation is on the money. I mean, he even wears a bolo tie. 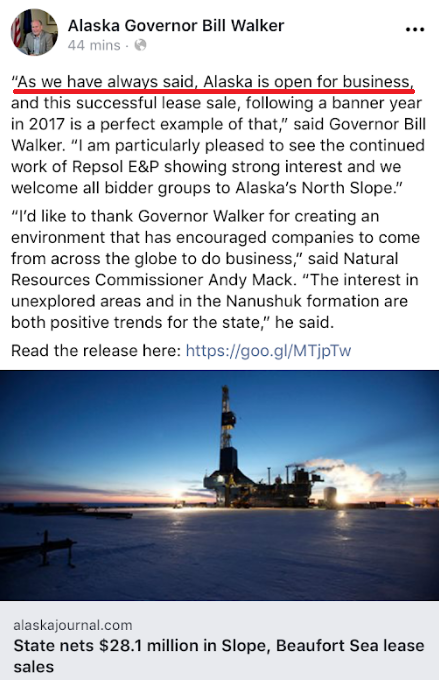 Meanwhile, current Governor Bill Walker is wrapping up his term by throwing some low-key shade at his successor. 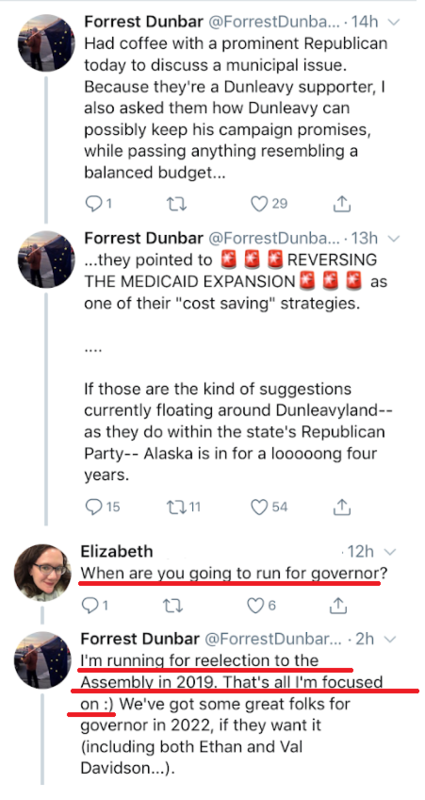 It looks like a couple folks still have some lingering questions about Governor Walker’s gas line. P.S. 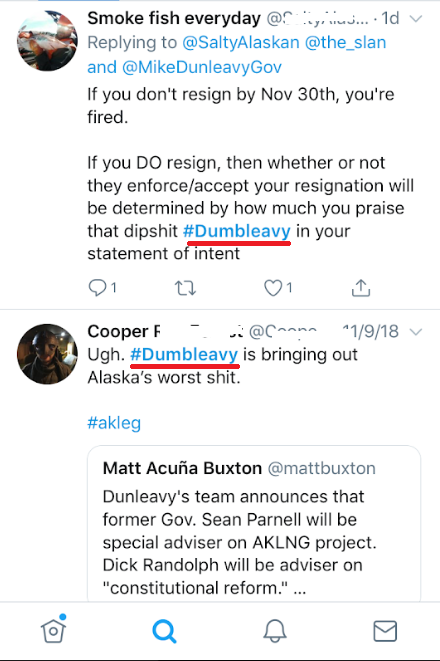 A warm Stalker congratulations to James Brooks for his new gig covering #akleg over at ADN. He’s one of our favorites. 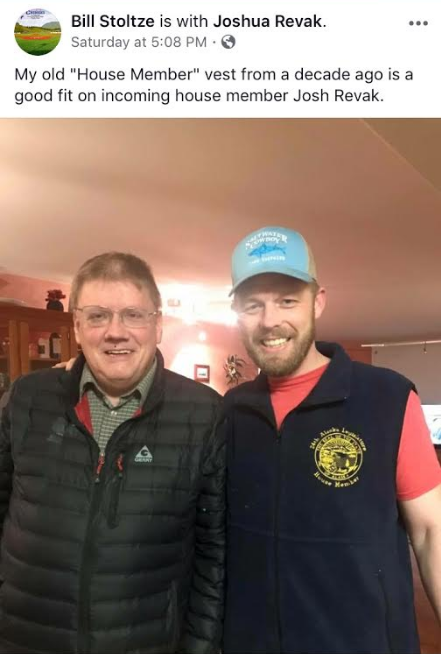 Moving on to the legislature, looks like former legislator Bill Stoltze has a vested interest in Representative-elect Josh Revak’s success in the House. Ba-Dum Ching! 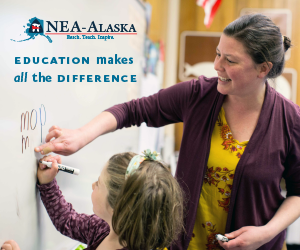 Meanwhile, Representative-elect Sara Rasmussen is looking for childcare while she’s in Juneau that doesn’t cost over $2,000 a month. Sara, I hear there are a couple of female lawyers in Juneau that miiiight just have some free time starting in December. Can they work for you while they’re suing the state tho? That might get awkward. 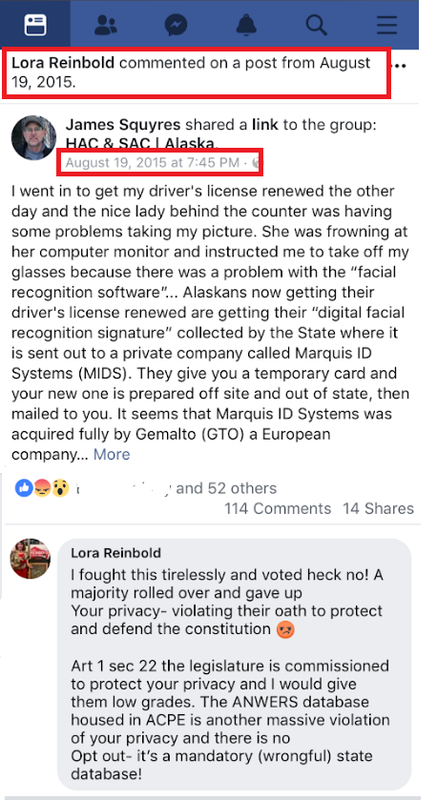 Senator-elect Lora Reinbold traveled back to 2015 on Facebook just to remind everyone how right she is all the time, and to foreshadow how much of a team player she’s going to be in the newly formed Senate Majority. 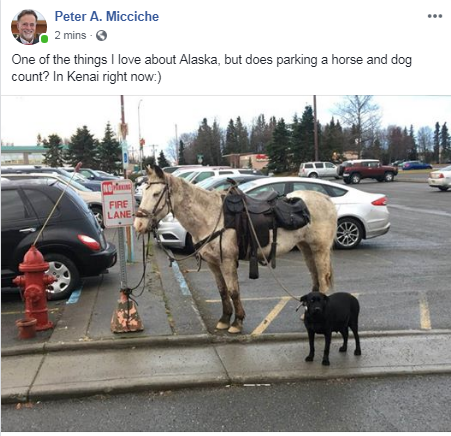 Senator Peter Micciche is posting about the dog and pony show a couple months early. Peter, session doesn’t start until January 17th! 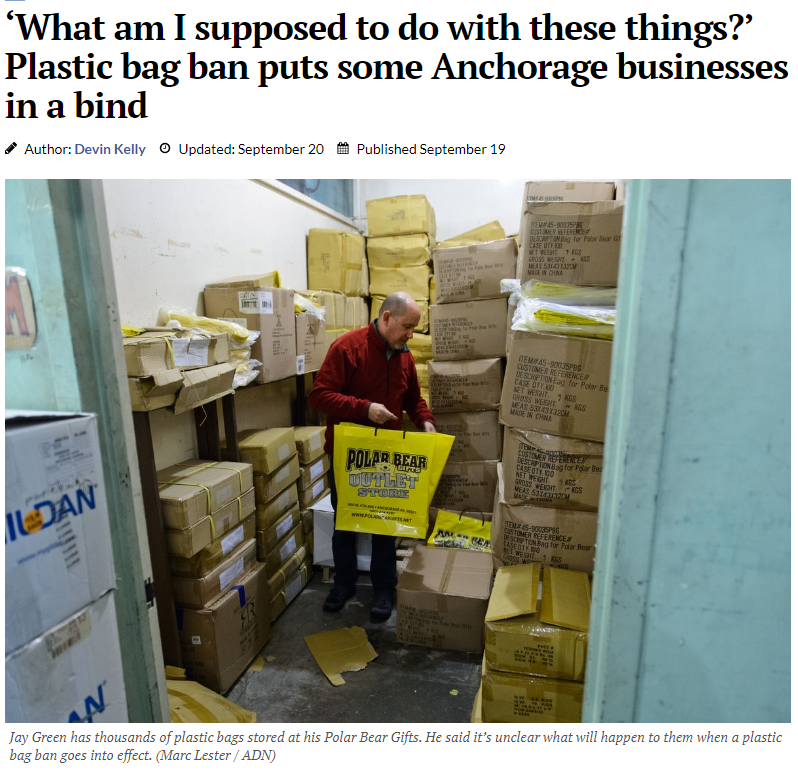 And in Anchorage, the local Assembly is discussing either eliminating a 1.5 million dollar city beautification program, that includes the flowers downtown, or redistributing those funds towards homeless services, a grant to the Dome, and… spy cameras? 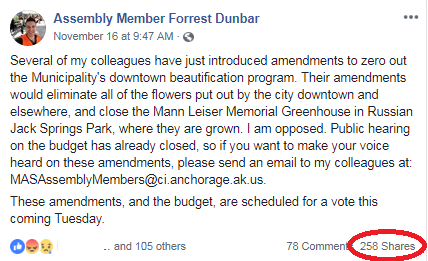 Assemblymembers Forrest Dunbar and Christopher Constant took to Facebook to try and save the flowers! Look at that engagement tho! While Forrest’s post was about what you’d expect, drama queen Chris just can’t help himself and used the word “killing” twice to describe the situation. 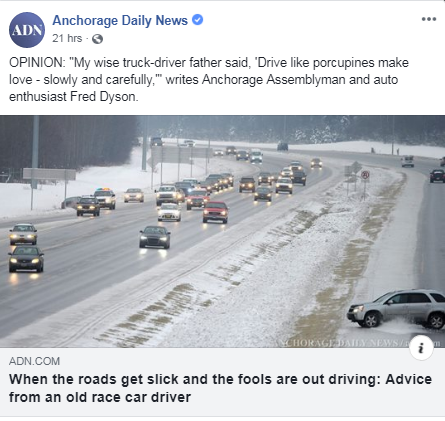 We read through the comments and we agree that the flowers make Anchorage a prettier place to live, work, and play in the summer. 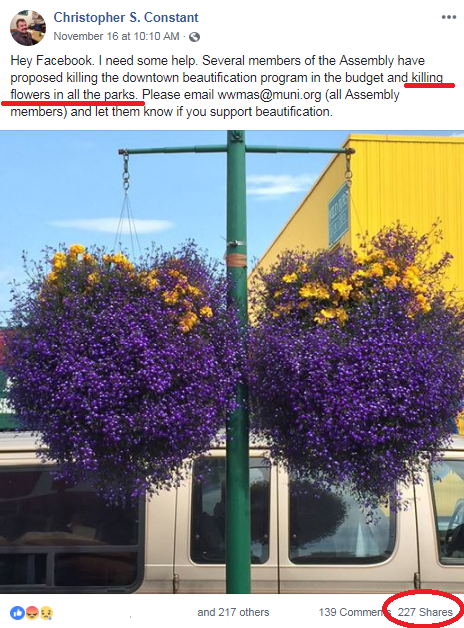 Even if it grinds our gears a bit when we see muni employees driving around during torrential rain storms and dousing the hanging baskets with their mobile watering vehicles. Oddly enough, the main argument for keeping the flowers around was, “because the tourists like them.” Well then. If we’re going to decide the budget and dictate policy based on what the tourists want, then bring back those plastic bags, baby!!! I have a feeling the tourists are REALLY going to miss seeing those plastic bags when they shop for souvenirs downtown this summer. Bags > flowers. 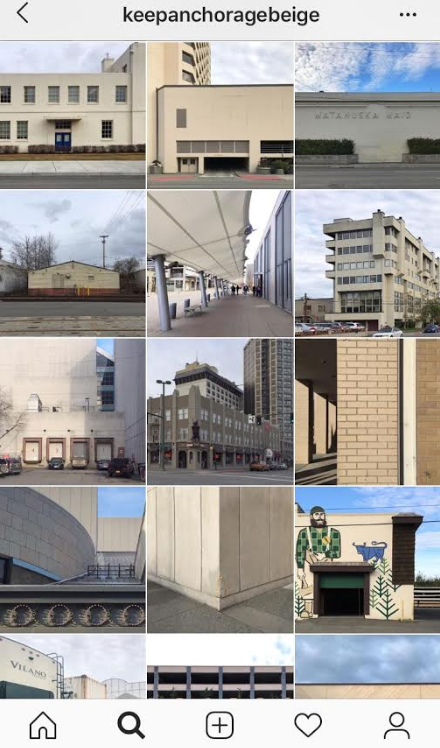 Honestly, the best part of this entire saga was discovering this amazing Instagram page someone mentioned: Keep Anchorage Beige. That’s my town! One more thing, Forrest. It’s really time to change out that Facebook profile pic. 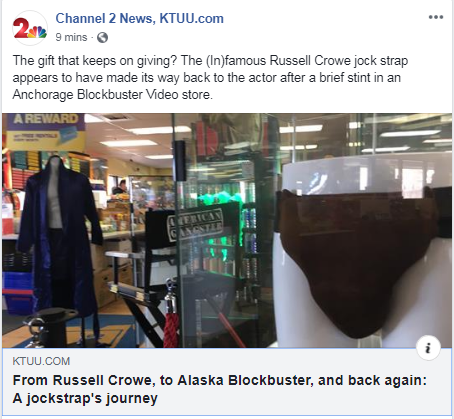 While the Muldoon Blockbuster and Russell Crowe’s jock strap will forever be in our hearts, it’s time to let this one go… It’s gone. After months of silence, you may remember Assemblymember Felix Rivera made a strong comeback on his official social media page. Alas, it was short lived. 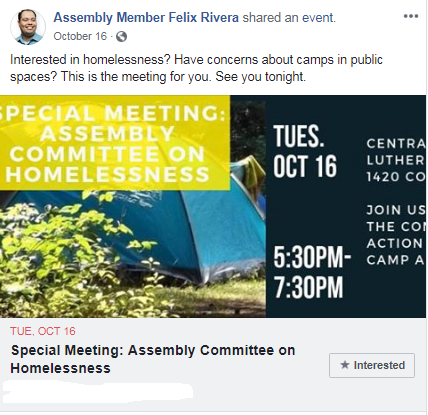 We haven’t seen much from him after this post asking those interested in homelessness to attend a special meeting. 😬 Alas. We get such a kick out of his stuff. Newest Assemblymember, Austin Quinn-Davidson, is slowly posting more on her official Assemblymember page. 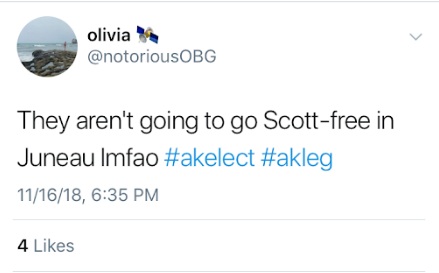 She might want to get with Forrest and Chris on how to increase her engagement. Although getting that many people to post “tax me, please” on what has historically been a highly unpopular tax (isn’t that right Assemblymember Traini?) is quite an achievement in itself. Overheard at RDC: “What’s the over under on Senator-elect Reinbold’s staffer situation this year? We say she gets up to 30 during her first term. I mean, she’s already at like what? 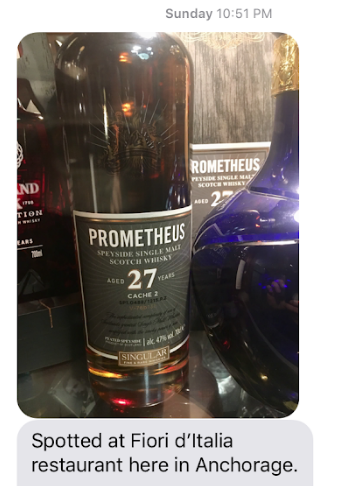 22? Sheeeesh. Senator Mia Costello meeting with Senator-elect Elvi Gray-Jackson. 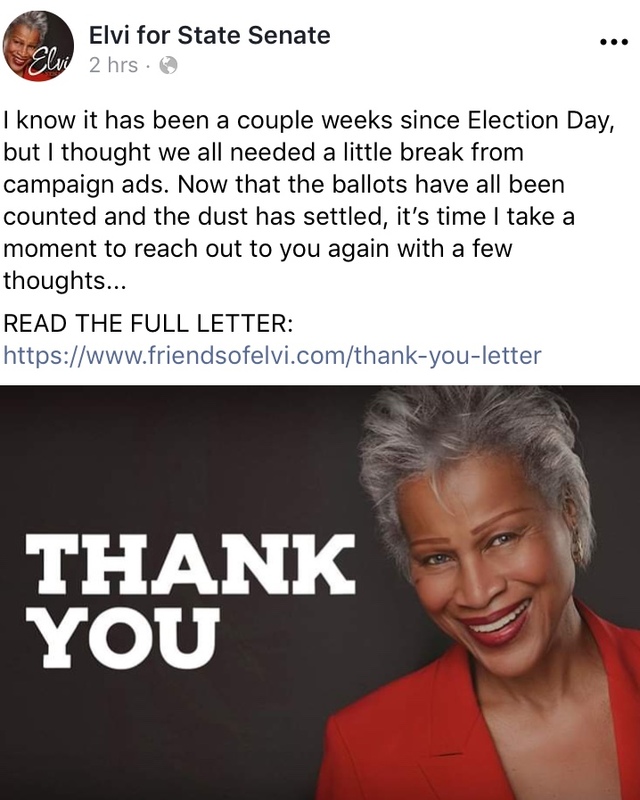 Speaking of Elvi, she just gets it. 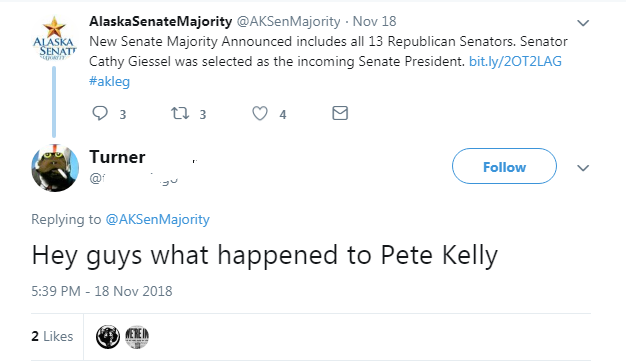 Thank YOU for the break Senator-elect. Per their name tags: Senator-elect Lora Reinbold and just regular old Representative Chris Birch. That juxtaposition tho. Representative-elect Zack Fields bravely introducing himself to Senator Cathy Giessel. Mad respect to Zack. I mean, she’s my Senator and I was still too scared to go up to her and say hi. 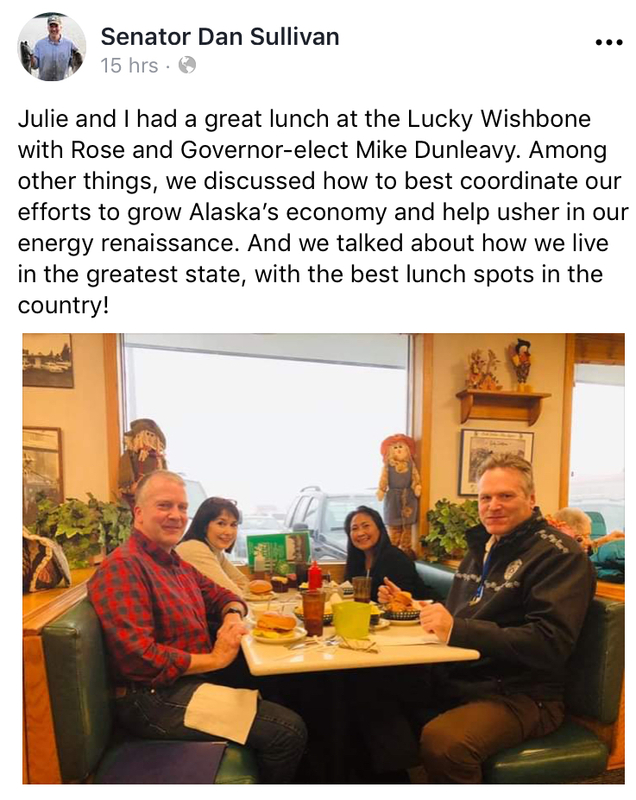 Landmine Editor-in-Chief Jeff Landfield and Landmine Corporate Council being seated for lunch at one of Anchorage’s finest, Lucky Wishbone, RIGHT NEXT TO Senator Dan Sullivan, his wife Julie, Governor-elect Mike Dunleavy, and his wife Rose. 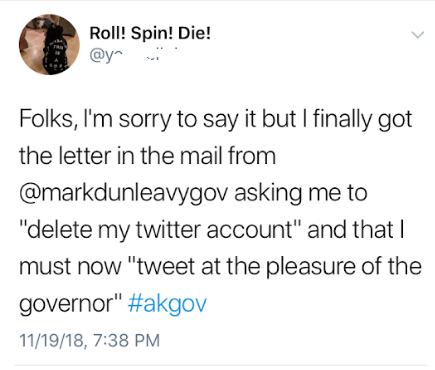 #thatssoAnchorage We extend our sincere apologies to the Senator and Governor-elect. Jeff proved to be semi useful and took this amazing photo of everyone – on Senator Sullivan’s phone! We hear he might have taken a selfie or two in the midst of a couple group shots. 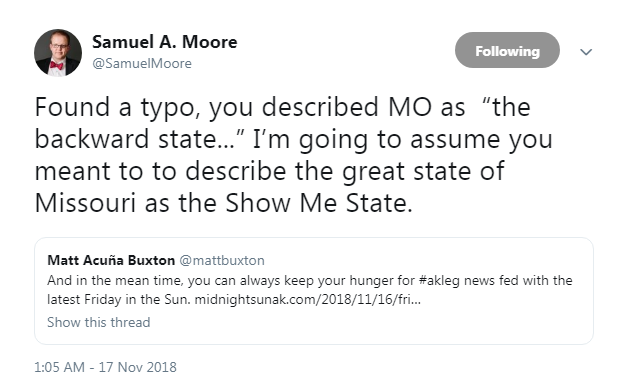 Dan, can you confirm? Sometimes we get our spotted ins a bit late, but some are better late than never. 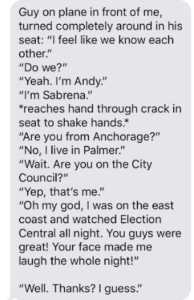 Spotted at a Halloween party in West Anchorage: a woman taking a walk in the neighborhood was invited to come on in and join in on the festivities. She said, “Okay!” and walked on over. It was none other than Senator Lisa Murkowski! 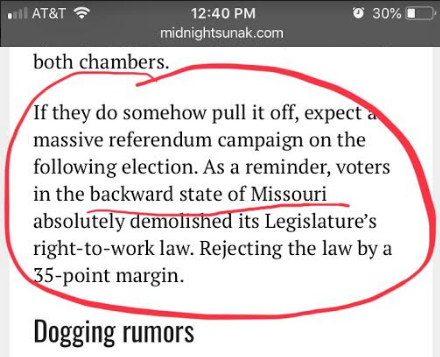 You can’t make this stuff up, folks. Sent to the Stalker. We do have a lot of lawyer fans. 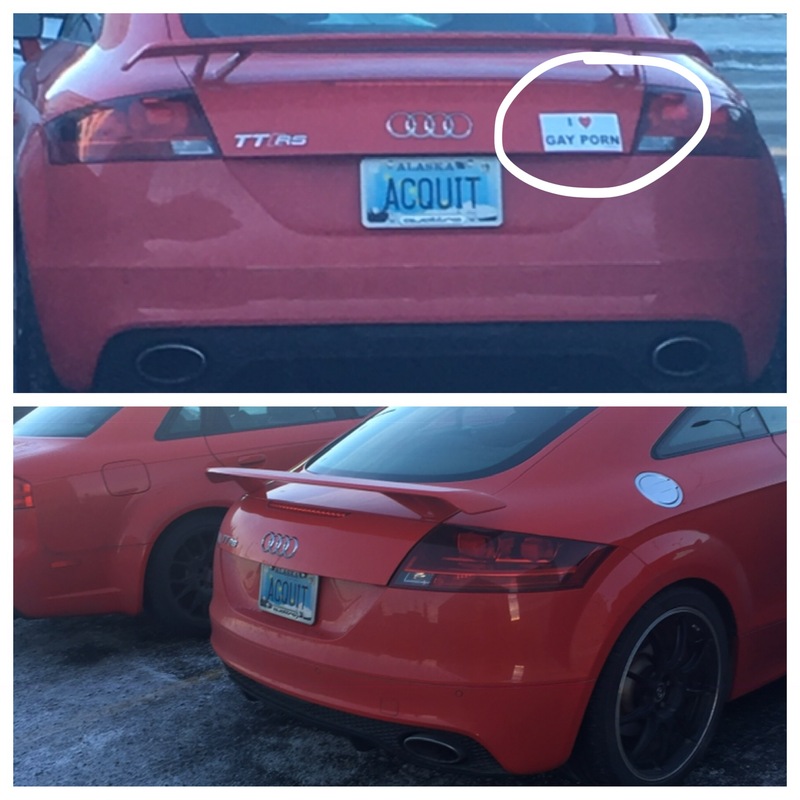 Spotted near the Anchorage Courthouse: walked by at 9am and saw this. It was gone by noon. If the sticker don’t fit you must acquit! Last call for this stale joke. LOL you think you’ve got some kind of moral high ground on Libby Bakalar? I just rolled my eyes so hard they’re now on the ground.